Witches' Brew -- Color Changing Halloween Drink | Low-Carb, So Simple! | Low-Carb, So Simple! Actually, if you are precise, this drink contains six ingredients. However, since usually water is not counted as ingredient I dare to publish this recipe here in my blog. You are allowed to complain. I don’t want to go deeper into boring chemistry here but just say that I take advantage of the fact that the color of red cabbage changes with pH, so depending how acidic or alkaline the solution is. First I prepare extract from red cabbage and create a blue-colored alkaline solution. Then I add the alkaline solution to almost colorless acidic solution where the red cabbage creates bright pink color. Baking soda is the alkali here and lemon or lime juice the acid. It’s as simple and natural as that! You really don’t need anything artificial to create fascinating stuff. First, create the red cabbage extract. Chop 8 oz (230 g) red cabbage. Place the chopped cabbage in a large saucepan and pour 4 cups (950 ml) boiling water over it. Cover, and let stand 15 minutes. Pour the mixture through a sieve into another, clean saucepan. Use the leftover red cabbage for another purpose (see the tip in the end of the post). 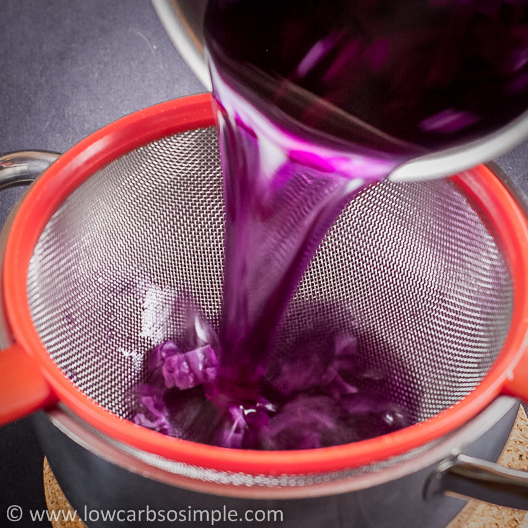 Create the alkaline solution by adding 1 teaspoon baking soda to the red cabbage extract and mix well. The color should turn bright blue. To make one serving of the drink, pour 2 tablespoons blue, alkaline solution into a small measuring cup or schnapps glass — where you have glued a symbol of skull and bones or something funny. This part you can do beforehand and store the filled measuring cups in the fridge until serving. Create the acidic solution by pouring 1 tablespoon lemon or lime juice into a clean glass. Add 1 teaspoon lime or orange stevia crystals. Mix well and let the crystals dissolve properly. Pour in the sparkling water. Mix if needed. Finish the drink in the front of your guests’ eyes by combining the two parts of the drink: pour the blue alkaline solution into the almost colorless acidic one and watch the colors change dramatically! First, create the red cabbage extract: Place the red cabbage in a large saucepan and pour the boiling water over it. Cover, and let stand 15 minutes. Pour the mixture through a sieve into another saucepan. This is your red cabbage extract. (Use the leftover red cabbage in the sieve for another purpose, see the tip in the end of the post). Add the baking soda to the warm red cabbage extract and mix well. The color of the solution should turn bright blue. Refrigerate the extract. To make one serving of ready drink: Take a small measuring cup or schnapps glass and pour there 2 tablespoons blue red cabbage extract. This is your alkaline solution. Take a clean drinking glass and pour there 1 tablespoon lemon or lime juice. Add 1 teaspoon lime or orange stevia crystals, mix well and let the crystals dissolve properly. Pour in 1/2 cup (120 ml) sparkling water. This is your acidic solution. Create the final, pinkish red drink by pouring the blue alkaline solution into the pale acidic solution. Those who know me are aware that I hate artificial food colorings and love chemistry. For a long time, I’ve been thinking of developing a recipe for a blue or violet drink — witches’ brew. Now, when the Halloween time is near, I got that itch again. At first I was planning to use blueberry juice. However, blueberry juice is not that easy to acquire all over the world. Moreover, the experiments I did with blueberry juice were not satisfying enough. Next I was thinking of red cabbage. From one of my childhood books I knew that red cabbage changes color with pH. It’s pink in acidic solutions and blue or green in alkaline solutions. I wanted to piggyback on that fact in my interesting drink. I made some red cabbage indicator (= extract) and did some experiments but I wasn’t really satisfied. I didn’t get that violet or blue hue, because all the stuff I used was quite acidic. I knew that baking soda was alkali, but it didn’t taste good, and that small amount which I could tolerate wasn’t enough to color the drink blue or violet. I was a bit disappointed. See you later, indicator. Suddenly I got a wild idea about color changing drink. How about if I combined two, different-colored parts and would get a third, completely new color? That was an idea definitely worth trying! I made some red cabbage extract, cooled it down and poured some of it into a small measurement cup with some additional water. Then I added 1 pinch baking soda to create alkaline solution. The fluid turned bright blue! How promising! Then the acidic part. I decided to use lemon juice. Lime juice would have been also an option, but lemons are more affordable. I poured 2 tablespoons lemon juice into a glass, added 10 drops liquid stevia and 1/4 cup (60 ml) sparkling water. I was thrilled to try out the combination of these two differently colored parts. I poured the blue solution into the pale acidic solution. The result: bright pink drink! Well, it could have tasted sweeter and I somehow could taste the baking soda somewhere in the background, but in general I was very positively surprised. My idea worked in practice! Next I added a tiny pinch of powdered vitamin C to get more acid. It didn’t change the pink color any more red, though. I also added some vodka to see if I can make adults-only drink. That worked. The color didn’t change but the vodka was a nice addition. I thought the red cabbage extract was too dark in color. I reduced the amount of red cabbage and increased the amount of water. First I had used 1 lb (450 g) red cabbage and 4 cups (950 ml) water. Now I reduced the amount of red cabbage to 8 oz (230 g). That worked nicely. I still wanted to try out, if smaller amount of red cabbage works. I put 4 oz (115 g) red cabbage in a saucepan and added 4 cups (950 ml) boiling water. The extract was quite light in color, and the alkaline solution didn’t produce red enough result when combined with acid. At some point I got the idea to add baking soda to the still warm red cabbage extract and not to the individual servings. When I had added the baking soda to the measurement cup with the cold red cabbage extract, it didn’t dissolve properly. Moreover, the amount — 1 pinch — of baking soda per serving was somehow too much, I could taste it in the ready drink. I was planning to pour 1 tablespoon baking soda to the whole amount of warm red cabbage extract. To my disappointment 1 tablespoon measurement spoon didn’t fit to the jar of baking soda and I had to take a smaller, 1 teaspoon measurement spoon. I added 1 teaspoon baking soda to the red cabbage extract and voilà! The fluid turned bright blue in no time. I was astonished that just 1 teaspoon baking soda worked that well. Even better, it dissolved completely and I couldn’t taste a trace of it in the ready drink. I remembered I had some stevia crystals with different flavors: strawberry, cherry, orange and lime. Since I wanted to have almost colorless or maximum pale, yellowish acidic solution, strawberry and cherry were out of question. Orange and lime stevia crystals were both great, but I preferred lime stevia crystals because of the flavor and the pale color. I would imagine kids prefer orange to lime, though. To get that bright pink hue, lemon or lime juice was needed in addition to the stevia crystals. The crystals were a nice addition tastewise, anyway. Moreover, the crystals dissolved nicely in the lemon juice, they wouldn’t have dissolved just in the sparkling water. This drink is quite sour, so you might want to add some more stevia if you need sweeter taste. Vanilla stevia gives also great flavor, cinnamon stevia as well. I also liked the taste of cola stevia. One note though, if you omit the stevia crystals and use only liquid stevia, I would recommend to use 2 tablespoons lemon or lime juice and add as much liquid stevia until you reach preferred sweetness. According to my experiments unflavored stevia is sweeter than the flavored ones. This might depend on the brand, though. Personally, I need 15 drops unflavored liquid stevia to sweeten one serving of the ready drink when I need 25 drops flavored liquid stevia to get enough sweetness. For adults, you can add some vodka to the acidic part of the drink before adding the sparkling water. You can also try with different flavors of vodka. Don’t use anything sweetened, though. After straining the red cabbage extract you have some chopped red cabbage left. You can make a nice side dish for example by frying the red cabbage in olive oil or bacon grease until the cabbage is tender. Season with salt, white pepper, a couple of drops stevia and teaspoon or two apple cider vinegar. Oh yes, because of the red, white and blue colors, this drink is perfect also for the 4th of July festivities. Next week, another creepy Halloween recipe. Mwahahaha! Stay tuned! Want to create a drink with something that doesn’t smell bad (like cabbage juice)? Try butterfly flower tea! You can buy tea bags online, and just one is enough to color a whole gallon of water. It’s more expensive, but a lot less work than making cabbage extract. The flavor is mild, and it’s the same chemical that causes the blue in red cabbage, so the indicator works the same. In Thailand, they serve it with a lemon wedge so it turns pink. Thanks for the tip! Never heard of butterfly flower tea before! Will this work with bottled lime/lemon juice instead of fresh squeezed? SO excited to try this! Thanks! Sure, it will work as long as it’s 100% juice or acidic enough 🙂 Hope you like it! You could also use cauliflower which also comes in the blue color as well and if you have children you can use this for a My Little Pony party and she can be a magician for her friends. Amaze them to delight. Great tip considering you find that type of cauliflower! Is there a way to add alcohol in it like vodka? Hi Debbie! Yes, absolutely, just add the alcohol to the acidic part. You might want to make a couple of experiments with the amounts beforehand so that you are happy with the color in the end. Very cool! Kind of like Data’s Samarian Sunset. Where a plain drink takes on a variegated color before settling. Thanks! Data was my favorite character in Star Trek…! As I was doing this for a Harry Potter themed party, I added food colouring to the Blue liquid to make it green. Also, I used some clear bubbly Sprite Zero instead, which changed it to a nice orange – Felix Felicis! (optional) Add the yellow food colouring to a cup and let dry. Add some ice to cover day of, and have participant add the blue liquid to the cup and have them mix it – change to green. Hi, thanks for trying out my recipe! Your variation sounds brilliant and really ingenious! okay I’m on board with a color changing drink (looks soooo coool) but this whole red cabbage extract thing sounds like no soda could ever save it. what exactly does this drink taste like? As long as you don’t add too much bicarb to your indicator any carbonated drink should cause the colour change (sparkling water has a pH of 2-3, buffered soda waters are under 4 as are commercial soft drinks such as sprite) the sweetening agent you use won’t dramatically affect the pH, citric juice juices will further lower the pH but probably aren’t necessary as such. Of course it’s worth testing it out before you put it in front of guests just in case. Adding less bicarb to make your indicator blue will also mean your finished drink ends up more acidic.The indicator should be blue at a neutral pH of 7-8 and become green to yellow as the solution becomes more alkaline. So you really don’t want to add too much bicarb. the amount of bicarb required to make it blue will depend on the water in your area so the best option is probably to use a form of titration to add the bicarb, make a solution of bicarb (maybe 1tspn in enough water for it to completely dissolve)then add it slowly (ideally dropwise) to the cabbage extract while stirring until you see a colour change to blue. This way the alkalinity will be as low as possible and the smallest amount of acid in the rest of your drink will be neutralised when you add the indicator. Hi Gabby, you can make a big batch of the acidic part — without the sparkling water — ready and keep it in the fridge until you are ready to serve the drinks. Add the sparkling water just before serving, so before you pour in the alkaline part. Great fun! Would a homemade lemon/lime sugar syrup & sparkling water work as the acidic solution? Would the color change still occur? Hi Marie! I doubt pure syrup works, it’s simply not acidic enough. However, if you add 1-2 tablespoons freshly squeezed lemon or lime juice per serving in addition to the syrup, the color change should occur. The red/pink color will be naturally brighter the more lemon or lime juice (= acid) there is. Hope you succeed with the drink! Actually if you make sure you use sparkling water rather than club soda it might work. Carbonating water makes it slightly acidic, but club soda often has baking soda added to counter that. So making sure your water has no baking soda added, but plenty of carbonation, might make it acidic enough. Hi Miranda, yes, exactly, that’s why I use sparkling water without any minerals. I don’t know if that tiny amount of baking soda in club soda ruins the color changing, I didn’t have any chance to try it out. But to be on the safe side, I recommend sparkling water, so just pure carbonated water. I think this would be fun. Why did you caution about no sugar? I am the one oddball who cannot tolerate stevia. I do like agave, maple surger, etc, but I mostly just use prunes and dates. I do like cabbage even though I hate the smell! Did you experiment if one can keep the cabbage brew in the fridge for a day to air out the house? Hi, you can sweeten this drink with something else than stevia, I guess agave would be fine too. Can you tolerate erythritol, xylitol or Splenda? I think powdered sweeteners are all fine to sweeten this drink. Just use 2 tablespoons lemon or lime juice per serving when using other sweeteners than those stevia crystals in the recipe. You’re right that the cabbage smells pretty awful when making the cabbage extract. However, I have stored the ready, blue solution in the fridge in a pitcher (without lid) for a few days and my fridge still smells fresh 🙂 So the ready solution is not smelly anymore. Hi there! I’ve found my way here from Foodgawker, and I must admit i’m not part of the no sugar crowd. Would sugar work in this recipe, or would it upset the chemistry? Hi, Eilidh, I would expect sugar works as long as you keep the other ingredients the same, so use sugar instead of stevia crystals.